USA x North Korea: the war of the broken against the torn. After suffering a considerable diplomat defeat in the Iranian subject, the Department of State returns to the load and the cameras with the North Korean subject. The tactics of Hillary is evident. 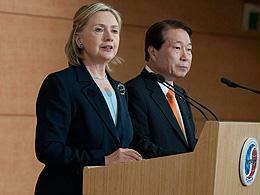 The American Secretary of State diverted the focus of the Iranian subject clearly for the Korean. Her message to the internal public is: "See like us are still influential in the world." Her message to the external public is: "We supported our allies. See like us have military credibility." The miraculous rebirth of the Korean subject exactly at this time in that the Department of State embitters the defeat in the Iranian subject, it gives what to think. Does Pyongyang seem to act in an orchestrated way, does it maintain lit the candle of the conflict and to preserve the decrepit North Korean regime (what can more make a regime that maintains his people miserable and starving except feeding the nationalism with the fear of invasion?) and does it supply to the decrepit American empire an escape valve for all their defeats and frustrations (what can more make the USA besides admitting that it is not in conditions of invading Brazil, Turkey and Iran?). This diplomat's American pendulum true danger is evident. When the wolves notice that the doe is sick they attack mercilessly. What is valid for a weak government (that can be dropped to the force through a civil war) it is valid for a fragile empire (that can be invaded and submitted to draft, as many other empires were it in the antiquity). In the next 20 years we will see the Americans embitter all the misfortunes that fomented for the world. Discord and civil war, real war in his own territory. The order of the postwar period is if dismantling before our eyes, but few people are capable to notice what is being hidden for the news since they are so many and his amount seems to obliterate the intelligence of all.